MONDAY, Aug. 1, 2016 (HealthDay News) -- As trampoline parks spring up across the United States, injuries to kids have jumped, too, a new study finds. Indoor trampoline parks, a relatively new phenomenon, are growing in popularity, said Dr. Kathryn Kasmire, the lead researcher on the study. In 2011, there were only around 35 such parks in existence, according to the International Association of Trampoline Parks. By 2014, that number had risen to 280. This growth appears to be accompanied by a surge in serious injuries among children and young people who visit the parks. Kasmire's team found that over just a few years, U.S. emergency rooms saw a 12-fold increase in the number of patients injured at trampoline parks -- from 581 in 2010, to nearly 7,000 in 2014. Children and teens accounted for most of those ER trips, with broken bones and sprains the most common injuries. There were a handful of severe injuries, though, including skull and neck fractures. "It's important for parents to be aware of the risks at these parks," said Kasmire, a fellow in pediatric emergency medicine at Connecticut Children's Medical Center in Hartford. The parks vary in their safety rules, she said. Some forbid "flipping" on the trampolines, but others allow it. Some limit how many people can be on the same trampoline at a time, while others don't. The parks usually have certain safety features, such as padded walls and employees who supervise the scene. However, that outward impression of safety can be a "double-edged sword," said Dr. Robert Glatter, an emergency physician at Lenox Hill Hospital in New York City. Padded walls and adult supervision help, Glatter said. "But," he added, "they can give parents a false sense of security." Children can still get hurt if they collide with other kids, hit the trampoline frame, or land awkwardly, Glatter pointed out. According to the trampoline parks association, the typical trampoline park is up to 40,000 square feet, and holds various trampoline "courts." Each court contains any number of trampoline "beds" that are connected to each other to form one large surface that's enclosed with padded side walls, or sometimes angled trampolines. The fact that kids get hurt using trampolines is nothing new. Home trampolines have long been recognized as a potential hazard, and the American Academy of Pediatrics advises parents against buying them. Those home versions are still the most common cause of trampoline injuries, the new study found. But, Kasmire said, there was no increase in ER visits due to home trampolines. The upward trend was confined to injuries sustained at parks. Dr. Barbara Pena is research director of the emergency department at Nicklaus Children's Hospital in Miami. She was not surprised by the increase in park injuries, because she's seen the trend firsthand. "We've always seen trampoline injuries," Pena said. "But now we're seeing more and more of them happening at the parks." The findings are based on records from a nationally representative sample of 100 hospital emergency rooms. Between 2010 and 2014, the hospitals saw almost 92,000 trampoline-related injuries (from homes and parks) each year, on average. 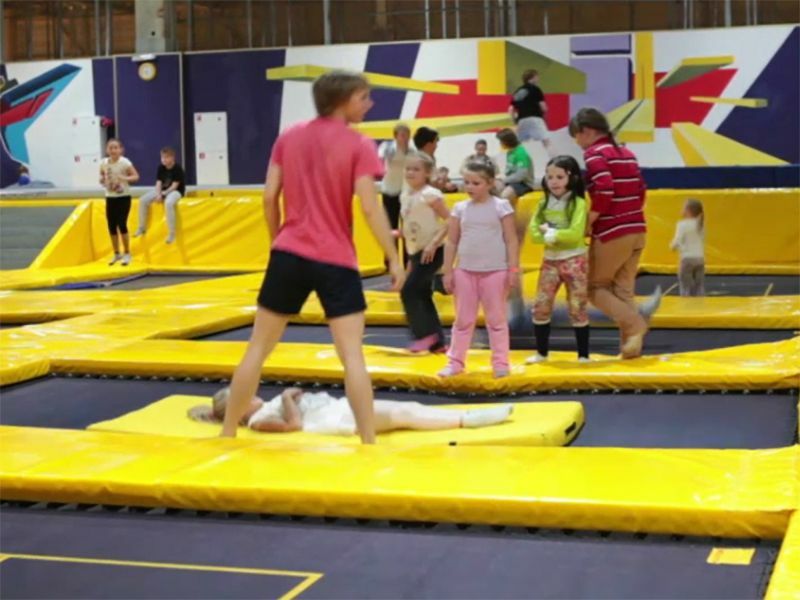 In 2014, nearly 7,000 people landed in the ER after a trampoline park mishap. Boys, average age 13, were hurt more often than girls. And younger children were more likely than teenagers or adults to sustain a bone break; fractures accounted for nearly half of injuries among children younger than 6, for example. Young children can be at particular risk if older, larger kids are jumping nearby, Glatter pointed out. "That's a recipe for disaster," he said. Pena agreed. "There should absolutely be a division of age groups at these parks," she said. If parents want to take the family to a trampoline park, Kasmire had some advice: Supervise your kids the whole time, forbid flipping or any other "stunts," and be wary if the trampoline area is crowded. Glatter suggested having kids wear the same type of protective gear they would when biking or skateboarding. While children and teenagers accounted for most park injuries, there were also adult patients. And it's teens and adults who are most prone to trying stunts, Kasmire said. She had advice for them, too: "Don't try to do things that are beyond your skill level." The study results were published online Aug. 1 in the journal Pediatrics.